Post about the tech i own and the sorta stuff I’ve been doing with them. More Commodore CD32 emulation fun. 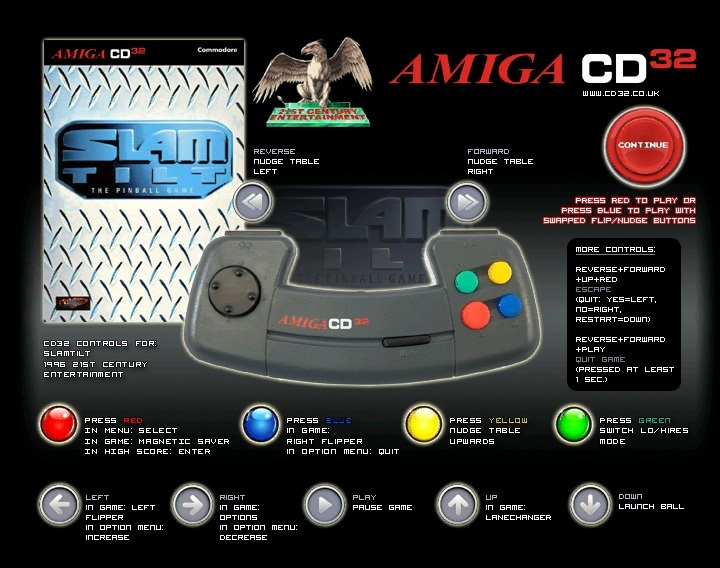 The guys at http://unofficial-cd32-ports.blogspot.co.uk/ rounded off their month long release of CD32 conversions a few days ago with one motherload of a compilation containing a whopping 160 Amiga games. You’d be hard pressed to find something fun to play with this lot and kudos for wrapping it all up into a neat little graphical menu. Even into October, ‘encore’ releases are coming out daily and their penultimate release today will be keeping me in very good company throughout the darkening nights. 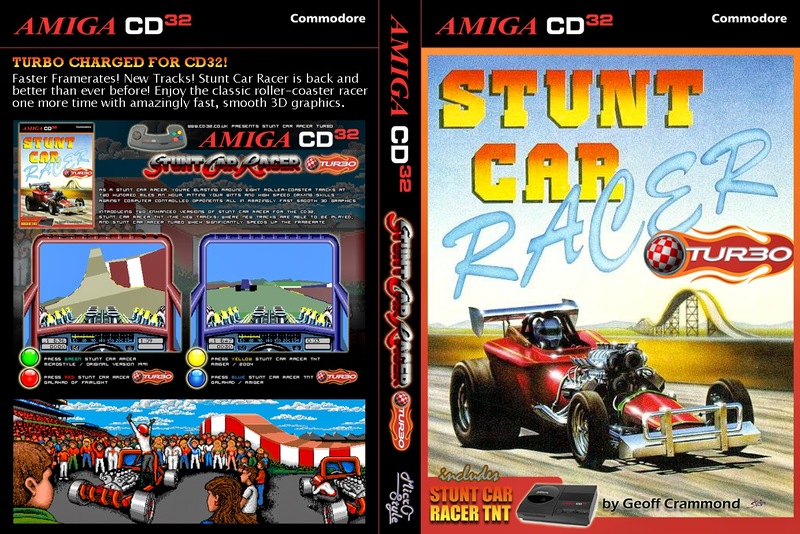 Stunt Car Racer, one of the many Amiga titles I’ll never tire of and am really looking forward to racing around those new tracks. One of these days, I’m going to link a couple of my Amiga’s together and invite a few friends around for an evening of ‘friendly’ racing. 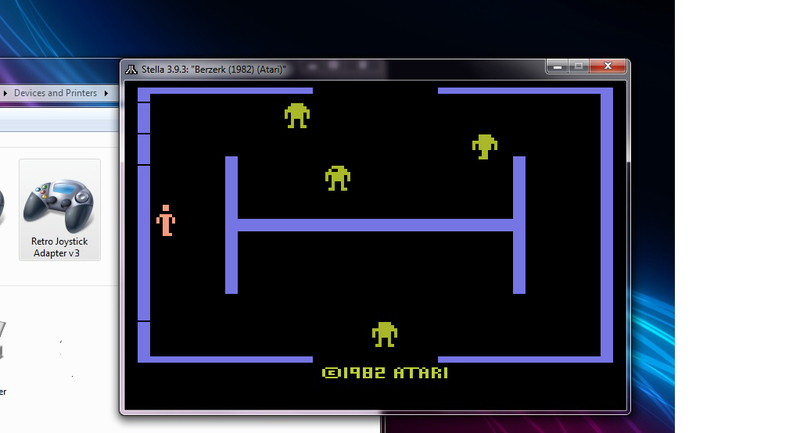 …but just going back to the 160 game compilation for a moment, it was whilst I was having a blast playing Joust did I realise how many people, each with their projects have come together, unknowingly to create what I have on screen that I’m waving my stick at (well pad) and grinning ear to ear. 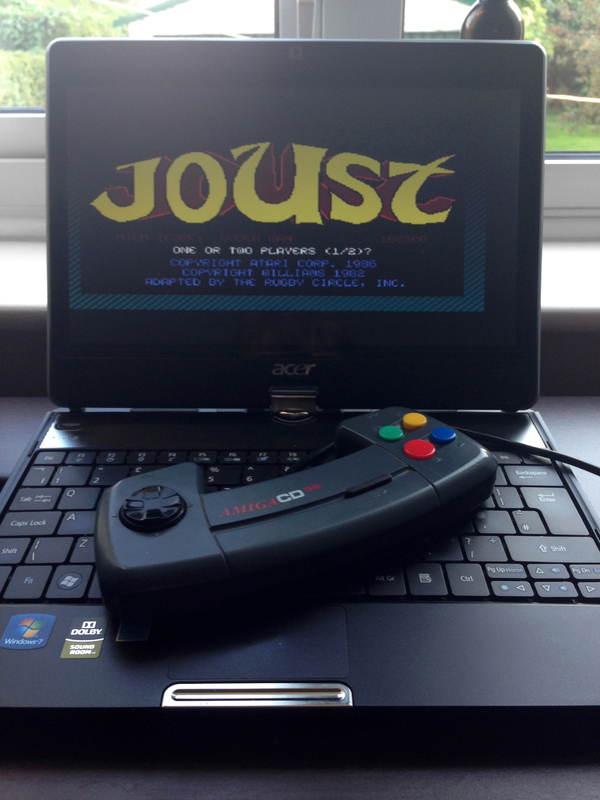 Here’s Joust, the rather funtastic Atari ST version of the Williams Electronics classic hit. Except, this one has been converted to run on the Commodore Amiga by http://meynaf.free.fr/pr/ and then converted again last month to run on the CD32…..which I have running on my Netbook thanks to the everyone behind the WinUAE project….connected to and controlled with an original CD32 gamepad thanks to Retronic Design. – Mind numbing, awesome-ness stuff but if I have to think about it any further I might need to go and have a lie down and I haven’t got time for that, there’s Ostrich prodding to be done…..erm! Testing my CD32 gamepad with Win-UAE. There’s been a great deal of activity within the Commodore CD32 camp this September, and the release of converted Amiga games being published each day. So far, the releases include popular titles like Cannon Fodder, Flashback, Skidmarks and Monkey Island 2 to name but a few and today’s release is the stunning Lionheart. Not content with just the providing the games though, they’ve also created custom DVD covers and controls screens for each game should you wish burn and print your own physical copy. I hope you agree, this deserves a mighty thumbs up! Sadly I don’t have a CD32 console any more to play these games on <note to myself, do not get rid of anything…ever…unless passing on to fellow retro gamers> yet the release on day 17 sparked my interest to try it out via emulation. Slam Tilt Pinball on the Amiga surely has to be one of the greatest 16-bit 2D pinball games out there. I’m a huge fan of the Fantasies/Illusions series on the Amiga but Slam Tilt’s four tables are just so much fun to play and have plenty to shoot for as well as a good dollop of humour and contain some of the very best DMD animations on a computer game. 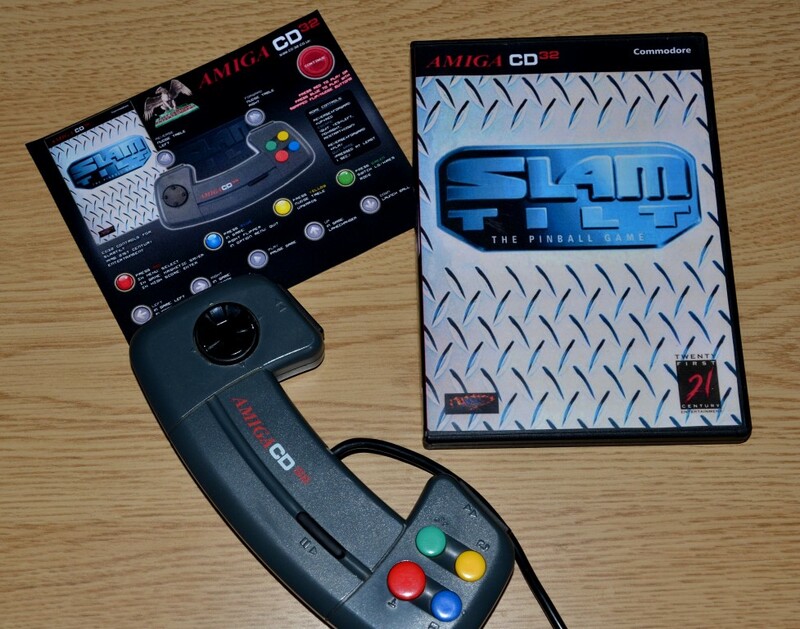 I’d usually play Slam Tilt Pinball from harddisk on my Amiga, but what interested me particular about this CD32 conversion was the additional option to use the CD32’s gamepad shoulder buttons to control the flippers as opposed to joy left and a single fire button (although that particular option is still available if you prefer it). It’s a personal choice of course, but for me, it makes the whole game even more enjoyable. But….as I mentioned above, I don’t have a CD32 console. What I do have is a CD32 gamepad though and that 9-Pin to USB joystick adaptor I posted about yesterday. 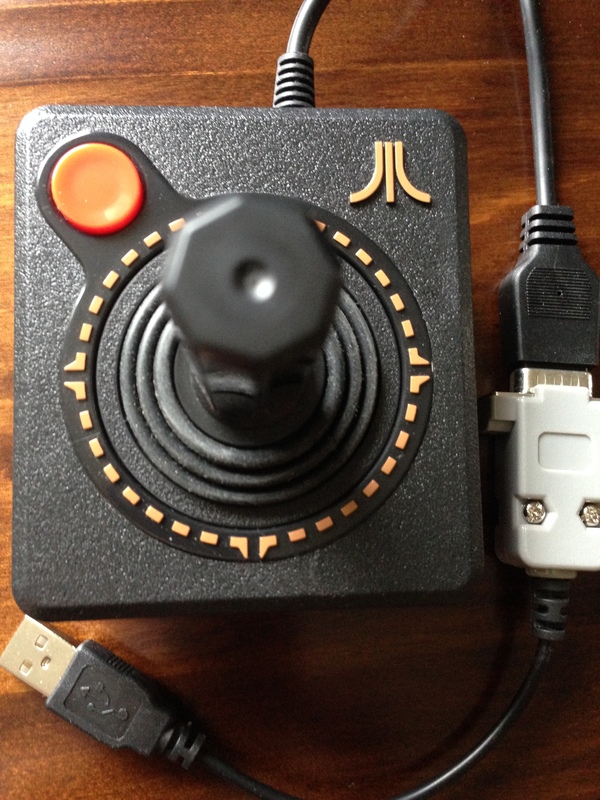 So first things first, I need to reconfigure the USB joystick adaptor because out of the box it’s flashed to support a three buttoned joysticks or gamepad. To set the controller into program mode, attach it to the USB adaptor, hold down fire button 1 on the gamepad (red on the CD32 pad) and plug the adaptor into the PC’s USB port. After a short pause, the PC detects the adaptor as a standard HID device. 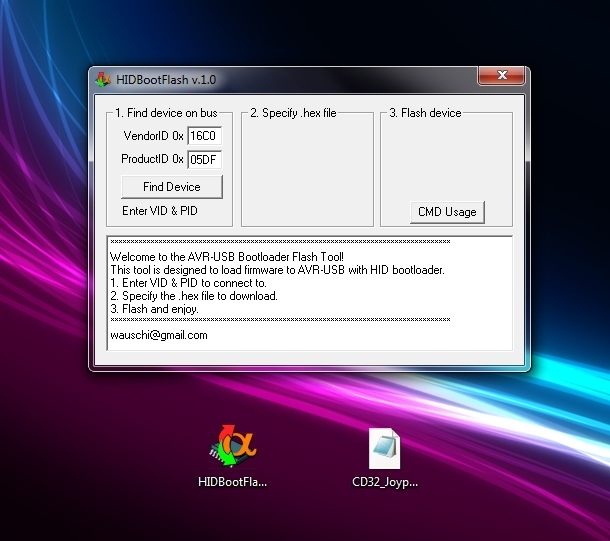 Open the HIDBootFlash, 1# select ‘Detect HID’ device 2# browse to the CD32 hex file #3 check the reboot AVR button and finally #4 press the Flash Device button. Once the device has been flashed, let go of the gamepad fire button, unplug the adaptor from USB port, wait a few seconds and then plug it back in again. Hopefully, it should now be detected as a USB game controller. Mine works o.k apart from the seventh (play) button on my controller. It could be that the actual game pad button is duff or that something is amiss but to be honest, it’s not a button I’m going to need and can always remap it to a keyboard letter if needed in Win-UAE. Also, I found that buttons 5 and 6 (on the CD32 gamepad, this is the shoulder buttons) appears to be the wrong way around. Again, no matter as this can be corrected by remapping in Win-UAE. …..and off we go. 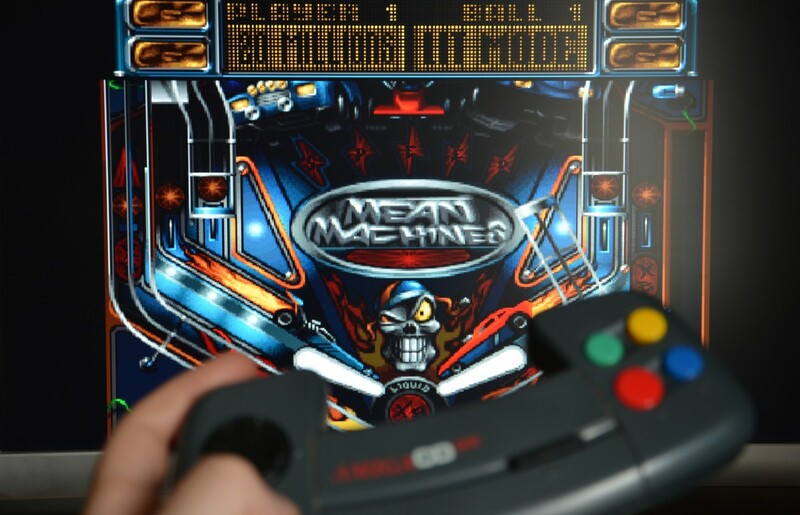 Slam Tilt Pinball on an emulated (win-uae) CD32 with original joystick support. Well, I thought I’d try again with another adaptor and one that has received some excellent reviews and a popular choice with my fellow retro gamers. I ordered via eBay, and three days later it arrived. Considering it was coming over from Canada, damn that was quick! On one end its the mighty USB (which may require flipping three times) , on the other there’s nine pins of retro gaming awesome-ness and somewhere in the middle there’s some sort of electronic fusion glue from Canada. 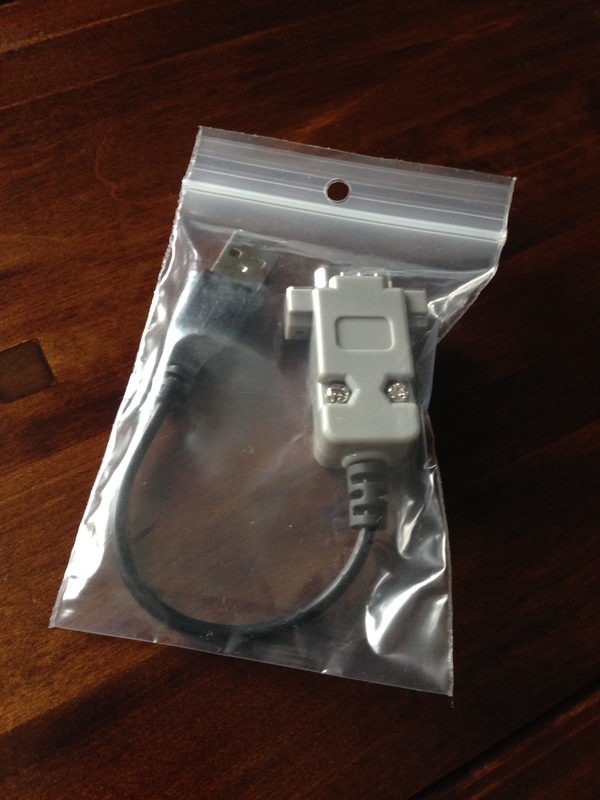 Out of the box, well little bag, it supports a whole range of 9-pin joysticks with up to three buttons. I’ve tried a handful of sticks from Cheetahs and Quickshots to Speedkings and Comp Pro’s to Zipsticks and Tac2 sticks – All work perfectly. 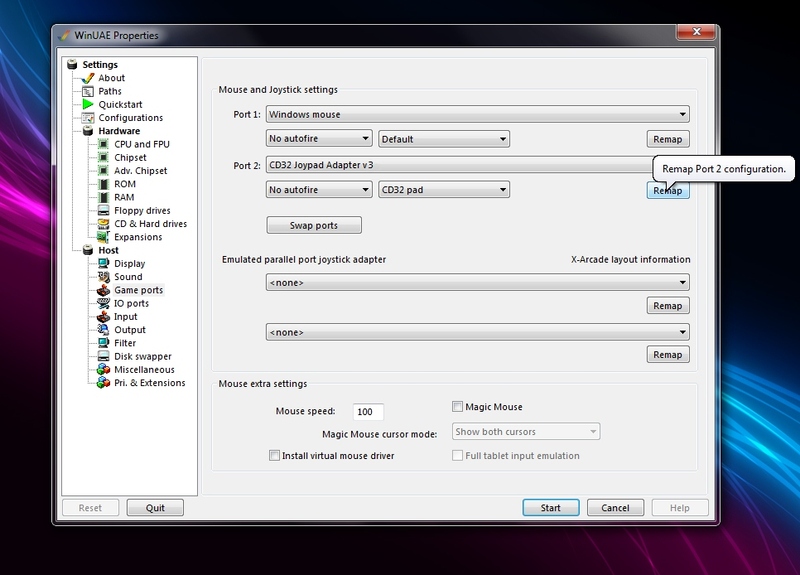 There’s also support for Sega Megadrive (3/6 buttoned) Amiga Mice,Atari 2600 paddles and many more after a quick firmware upgrade using the tools available on the owners website. 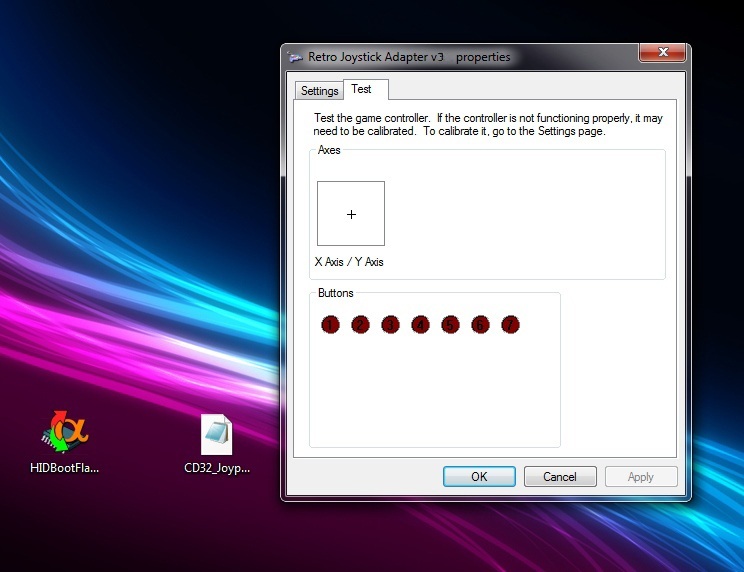 Retro Joystick detected as a standard gamepad in Windows or can be configured as a keyboard/cursor joystick with Joy2Key etc. Although not listed on the website, I thought I’d try is with my Panasonic 3DO pad (it didn’t work) and just for laughs (and fingers crossed that it actually might work) my Vectrex Pad….which it didn’t – well, the joystick was non responsive but the four buttons respond as directional control. All in all, a great product and a great way to get more out of your emulation fun. 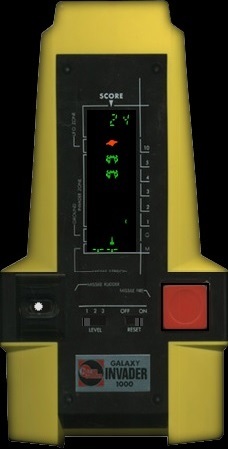 After catching the latest (July) RetroGamingRoundup show, and thoroughly enjoying their top ten tabletop electronic games feature, I remembered an old friend tucked away that I haven’t used for a while. 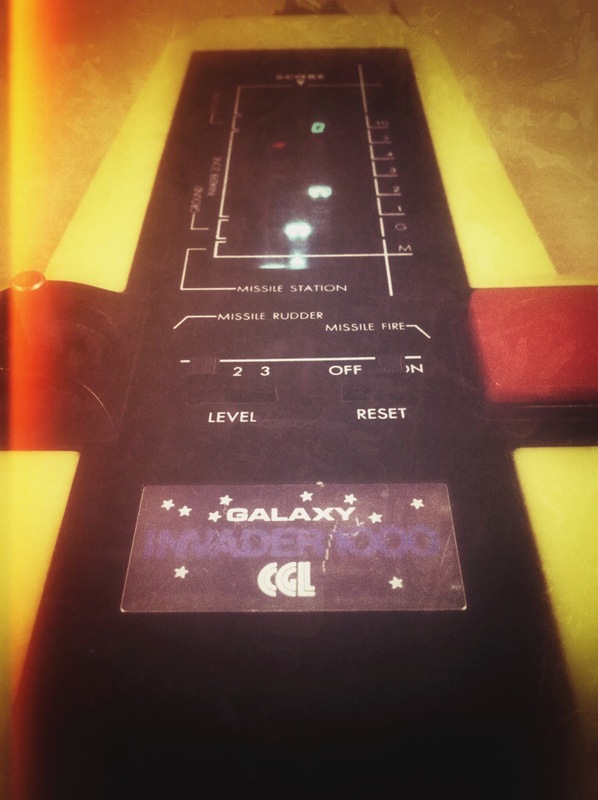 This is my CGL Galaxy Invaders 1000, a Christmas present I received in the 1980’s and has been with me ever since. It’s not been used for a while and the battery terminals aren’t looking their best anymore. I inserting new batteries (I forgot how many these things need!) and as expected, it didn’t work. I keep meaning to get one of those multiple voltage adaptors but until then, I’ve had a go at a quick fix and replaced the rusted terminals with those taken from an old battery operated radio. Mission accomplished. Wow, this really does take me back a few years. Pew pew pew! Black Friday, a day of mass consumerism madness. I’ve just been watching some of the awful footage on YouTube of leagues of customers going quite literally bat crazy over everything. I’m currently eating my hat….but at least it’s my hat and not someone else’s hat that I’ve just snatched from their limp hand whilst running them down with my shopping trolley. Just think how bad it’ll be come the zombie pandemic?